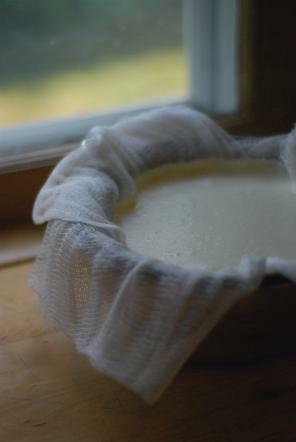 Whipping up a batch of homemade ricotta is as simple as this: heat a pot of milk, add some acid to create curds (I use lemon juice), and pour the mixture through cheese cloth — then have the patience to wait an hour or two until the mixture has strained to the appropriate consistency. The result is an entirely different, entirely creamier version of ricotta as you know it. The flavor is mellow and smooth, and the texture is impossibly luscious, almost like a very firm whipped cream. You’ll want to dollop it like little cool pillows on every baguette you see. I’ve been making homemade ricotta for a few years now, and I can safely say it is the cornerstone to my absolute favorite summer appetizer: an outrageous bruschetta. Imagine a swipe of this cool homemade ricotta on a piece of crusty baguette, topped with a leaf of basil, a slice of the ripest tomato, and a drizzle of syrupy balsamic. Perfection. Hurry down to the recipe below — summer’s a-wasting. Line a fine mesh strainer with a few layers of cheesecloth, and set over a bowl. Set aside. In a medium saucepan over medium heat, warm the milk, cream and salt to 190 degrees, stirring occasionally with a rubber spatula so the bottom doesn't scorch. When the mixture reaches 190 degrees, remove from heat. Add the lemon juice, and stir gently (just a few stirs) to just incorporate the lemon juice into the milk mixture. Let sit, undisturbed, for 5 minutes. After 5 minutes, curds will have formed. Gently pour the mix into the cheesecloth-lined strainer — this will separate the curds from the whey (the whey is the liquid part and you'll discard this). Allow the cheese to strain for 1-2 hours; it will get thicker the longer it strains. I usually strain the cheese for the full two hours for the bruschetta recipe. Toast the baguette slices. Preheat the broiler of your oven, and position the oven rack to the top position. Set the baguette slices on a cookie sheet, and drizzle them with olive oil on both sides. Place the cookie sheet under the broiler until bread is lightly toasted - about one minute on the first side, then flip the bread over and toast about 30 seconds on the other side. You want bread that is lightly toasted but not overly hard and crunchy. 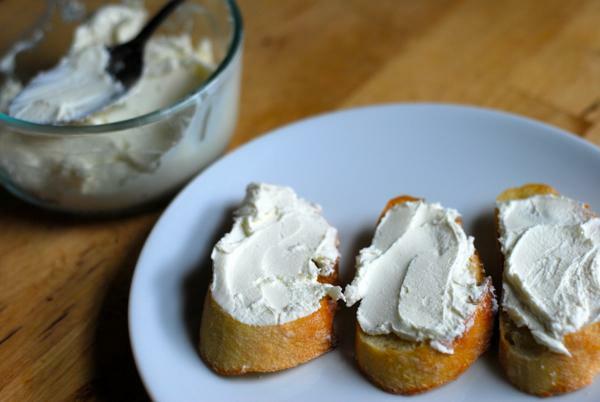 Spread baguette slices with a thick swab of ricotta cheese. 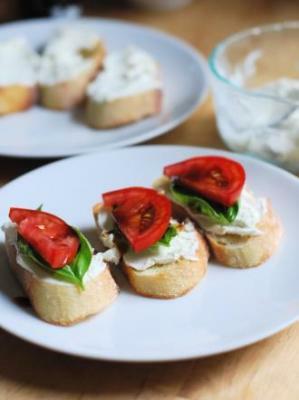 Press one piece of basil onto the ricotta on each baguette slice. Set a tomato slice on top, then season well with salt and pepper. Drizzle with olive oil and balsamic and serve. 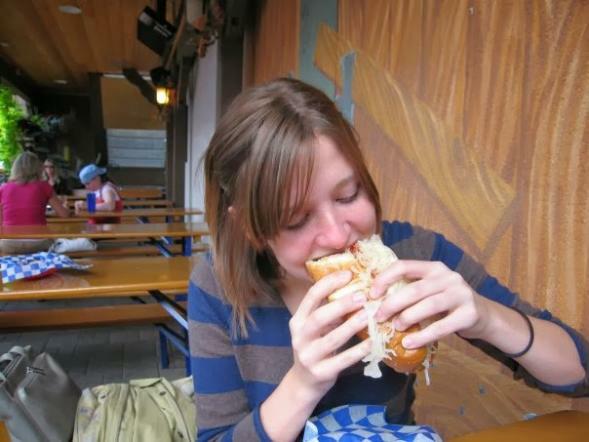 Carley Bohnen is a Minnesota writer and cook. By day, she works in the technical world of interactive project management, but by night, she's usually standing in the kitchen with her sleeves rolled up, hunched over a pot or pan or mixing bowl of something. Follow her food blog, beans, which runs that gamut from baked chickpeas to red wine pot roasts.